1. Revlon ColorStay Liquid Eye Pen: I use this for the winged eye (cat-eye-look). The pen stays steady while applying and last through the day without smudging or fading. I had used it here and here, recently on the upper lid. 2. Hashmi Kajal: It is only available in India/Pakistan (as far as I know). It is great for creating a sharp yet dramatic look. I like to use it when I am going for a deep-thick-under-lid-look. I had used it here recently and here earlier this year on the lower lid. 3. Maybelline EyeStudio Master Drama: I like the soft tip of this pen and find it great for when trying to apply the liner close and soft on the upper lid. I had used it here and here recently. 4. Revlon Luxurious Color Smoky Crayon: As the name suggests, this one is is great for doing the smoky eye or a smudged-liner look (which I look). I had used it here. 5. Benefit BADgal: This one is probably the oldest and the most trusted liner I have been using for over 10 years. It is waterproof and lasts the whole day. I have used it probably in 70% of my posts but definitely here and here, on the lower lid. 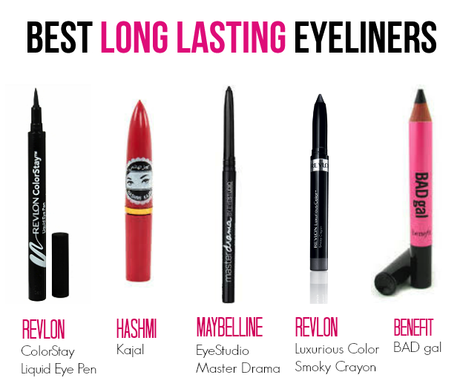 If there is an eye liner you trust, do let me know. That's the only beauty product I use daily!